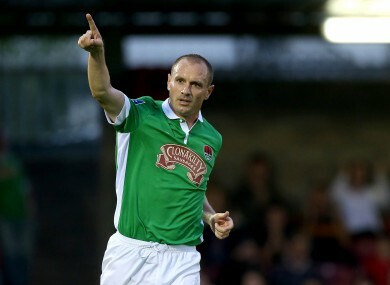 John Caulfield hopes to see the 37-year-old return to City in a non-playing capacity. COLIN HEALY HAS today announced his retirement from football. The 37-year-old, who won 13 senior Ireland caps, calls time on his career after making over 100 appearances in two spells with Cork City, having also had stints with Celtic and Sunderland. “Colin was a huge player, both on and off the pitch,” said City boss John Caulfield, who went on to express a hope that Healy would return to the club in a coaching capacity. “We all remember him for that phenomenal overhead kick in the last minute against St. Pat’s, which will live long in the memory, but over the last three years that I have been here, he made a massive contribution to the club. Email “'A huge player on and off the pitch': Cork's Colin Healy retires from football”. Feedback on “'A huge player on and off the pitch': Cork's Colin Healy retires from football”.